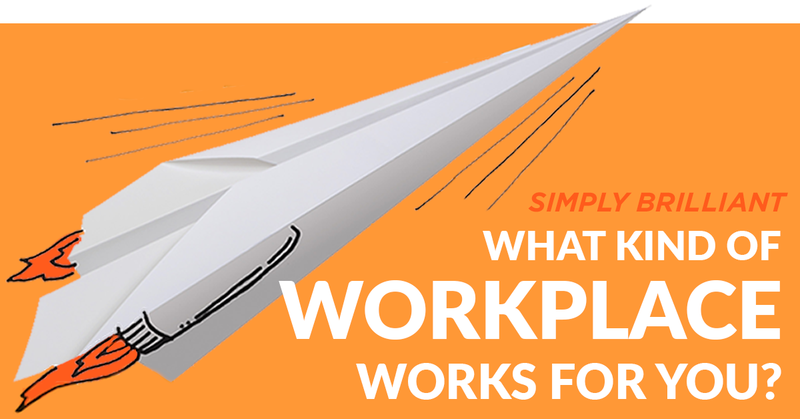 What Kind of Workplace Works for You? The quiz below is based on the four kinds of workplaces Bill discusses in his Harvard Business Review article, 4 Kinds of Workplaces, and How to Know Which Is Best for You. We all want to be part of a great organization and a high-performance workplace. To be at our best, surrounded by colleagues who help us and challenge us, doing work that is financially rewarding and personally meaningful. But there’s more than one kind of successful organization and many kinds of productive workplaces. Ultimately, what matters at work is whether the culture that defines life inside an organization is compatible with your personal style and priorities. This test will help you figure out the conditions under which you do your best work, and what kind of workplace works for you. It takes just a few minutes to answer the questions and learn more about the kind of setting that will bring out the best in you. For an accurate result, make sure your answers reflect what you really value and care about, rather than what you suspect others might think you should value and care about. There are no right or wrong answers, no one ideal place for everyone to work. Here are the questions…Get to work! Let’s say you are choosing among several jobs, each of which fits your professional background and skills. Which one of these factors would be most important in your selection (choose only one)? Let’s say your organization launched a high-profile product or service that ran into big trouble. Fixing it could mean late nights, intense pressure, management scrutiny, even the need to challenge established policies and procedures. Would you…. Enter your email to get your results and an overview of Bill’s latest book, Simply Brilliant. Your results will appear immediately on your screen.